In November of 1892, Prendergast composes a long, rambling letter to A.S. Trude, one of Chicago’s most prominent lawyers. Prendergast writes as if he and Trude are friends. Trude receives the letter, and though he dismisses it, he keeps it, fearing that Chicago is producing more and more unstable men, like Charles Guiteau, who assassinated President James Garfield. Unlike many of the other characters in Larson’s book, Trude seems to sense that the disturbed people around him are capable of violence. This is because he recognizes the precedent for disturbed men attacking politicians, as in the case of Guiteau and Garfield. Arn, Jackson. "The Devil in the White City Part 2, Chapter 8: Prendergast." LitCharts. LitCharts LLC, 1 Jul 2015. Web. 23 Apr 2019. Arn, Jackson. "The Devil in the White City Part 2, Chapter 8: Prendergast." LitCharts LLC, July 1, 2015. 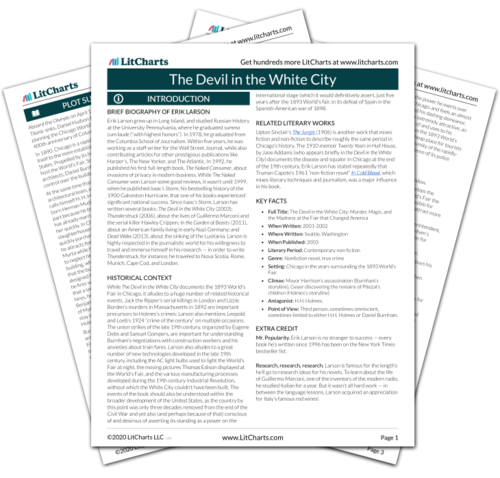 Retrieved April 23, 2019. https://www.litcharts.com/lit/the-devil-in-the-white-city/part-2-chapter-8-prendergast.